Your heel is the back part of your foot. A band of tissue called the plantar fascia connects the heel bone to the bones in the ball of your foot. Nerves run from the heel up the inside of your ankle and into your leg. 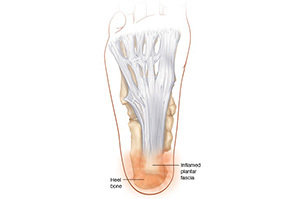 When you feel pain in the bottom of your heel, the plantar fascia may be inflamed. Overuse, Achilles tightness, or excess body weight can cause the tissue to tear or pull away from the bone. Sometimes the inflamed plantar fascia also irritates a nerve, causing more pain. Wearing shoes with poor cushioning can irritate the tissue in your heel (plantar fascia). Being overweight or standing for long periods can also irritate the tissue. Running, walking, tennis, and other sports that put stress on the heels can cause tiny tears in the tissue. If your lower leg muscles are tight, this is more likely to occur. A tight Achilles tendon will also contribute to heel pain.